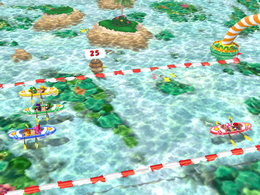 Synch-row-nicity is an 8-player minigame in Mario Party 7. Its name is a pun on the word "synchronicity". In this minigame, the goal of the players and their partners is to tilt the control stick from side to side to advance. The team that reaches the finish line first wins. To succeed, the player must consecutively tilt with synchronization, as the minigame's name implies. In the intro, the player and seven others are all divided into four individual teams, in four canoes. The players get ready by grasping their oars with both hands. Rules – "Row in sync with your partner as you head for the goal." Advice – "If you match the timing of your rowing, the boat will move much faster." This page was last edited on April 13, 2019, at 18:34.